There are so many things I should be doing. Such as packing and sorting for Hong Kong. Making more Christmas presents. Finishing my softie for Mirabel. But when my little Miss 4.5 asks if I want to play "play dough" with her, how can I say no? When she was much younger, I tried to stop her mixing up all the play dough colours. It did not really work. It is not much fun keeping all the colours together. 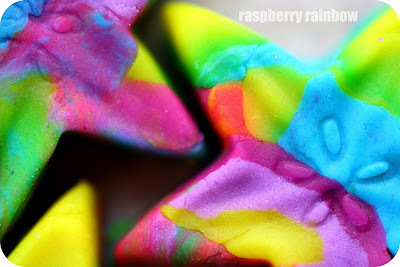 I am now glad we mix them all up - look how beautiful little play dough stars can be. Pop over and visit Kirsty for many more creative peeps. So cute! My mum was more worried about me eating the play dough at that age than mixing the colours...! This is so sweet! I don't let colours mix yet...perhaps I should try as they get a bit more manky. there's something so nice about the dough when it's all squishy and soft and new. Super sweet blog you have. Playdough with the small is much more important. That's the prettiest play dough I've ever seen! How creative is that!! You rainbow Queen!!! so pretty! you're right, it's more fun to just let things get all messy and mixed up sometimes.